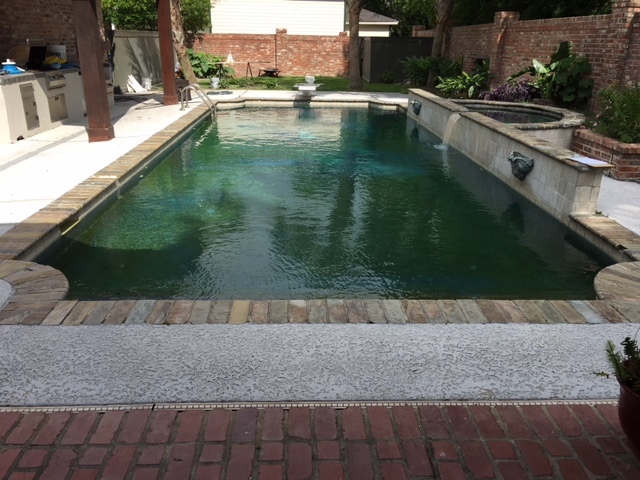 Gunite tile and decking renovations are expertly done by our seasoned employees here at All Seasons Pools & Spas. If you’ve purchased a home with a gunite pool, but want to change the look of it, we can help. We will take that old and outdated looking pool and make it beautiful again. We will remove the surrounding surface and replace it with tile of your choice and completely resurface the pool bottom as well. Purchasing a home with a pool can be a daunting choice, so let All Seasons turn that gunite pool into a backyard getaway. Call or visit us right here in Lafayette. This is the pool before the tile renovations began. And lastly, the finished product.